Alisa Apartment Vientiane is located at Hom 1, Khouvieng Road, Phonsavahn Tai Village, Sisattanak District Vientiane Capital. Ideal for both business and leisure, the apartment is conveniently situated within major commercial and shopping and food area. It also well suited for families within minutes walking distance to VIS school and Panyathip Kindergarten. Let the friendly staff of Alisa welcome you home. 2 Bedroom apartment offer modern facilities . I recently was involved in an accident and I damaged another Toyota vehicle. The mechanic, Mr.Anavath Inthalungsi, gave me a list of damages caused by me. I signed the repair list trusting him telling me the truth. When my insurance went to checked, they were many items that were old damages. Is this how Toyota authorise their workers to do? Encourage insurance fraud? Now they are forcing me to pay for what my insurance do not want to pay. Then I found out the mechanic is the truck owner friend. Xiangkhouang (Lao: ຊຽງຂວາງ, meaning "Horizontal City") is a province of Laos, located in the Xiangkhouang Plateau, north-east of the country. Originally known as Muang Phouan, the present capital of the province is Phonsavan. The population of the province as of March 2005 census is 229,521. Xiangkhouang Province covers an area of 15,880 square kilometres (6,130 sq mi) and has largely a mountainous topography. The province borders Luang Prabang Province to the northwest, Houaphan Province to the northeast,Vietnam to the east, Bolikhamsai Province to the southeast, and Vientiane Province to the southwest. Apart from floodplains, the largest area of level land in the country is located in the province's Xiangkhouang Plateau. This area is characterized by rolling hills and grassland whose altitude averages 4,250 feet (1,300 m). The country's highest peak,Phou Bia (9,252 feet (2,820 m)), rises at the southern side of the plateau. Nam Et-Phou Louey is a National Biodiversity Conservation Area (NBCA) in the province which covers a total area of 5,959 km2, and overlaps into Houaphan andLuang Prabang provinces. Xiangkhouang Province is one of the main maize producing areas of Laos. It was heavily bombed during theVietnam War era. The Plain of Jars site has been proposed for listing as a the UNESCO World Heritage Monument. While the origin of the Plain of Jars' people is unknown, the recorded history of Xieng Khouang is interlinked with the Tai Phuan. As an ancient civilization, its prehistory is linked to the enigmatic megalithic stone jars of the Plain of Jars (with prehistoric material recorded to the period of even 2000 BC, with Iron Age period of 500 BC and 500–800 AD period dominating the archaeological finds) representing burial grounds of ritualistic practices with extended history spread from Angkor period to the Hindu and Buddhistreligious impacts. The Tai Phuan or Phuan people are a Buddhist Tai-Lao ethnic group that migrated to Laos from southern China and by the 13th century had formed the independent principality Muang Phuan at the Plain of Jars with Xieng Khouang (the contemporary Muang Khoun) as the capital. They prospered from the overland trade in metals and forest products with India and China. In the mid-14th century, Muang Phuan was incorporated into the Lan Xang Kingdom under King Fa Ngum. The Xieng Khouang Plateau has been surmised, based on archaeological finds of Bronze and Iron Age of the period between 500 BC and 500 AD, as the center of trade representing a large area of upland Southeast Asia covering Vietnam, Samrong Sen inCambodia, and the Khorat Plateau in northeast Thailand, Danang City in Laos, and the North Cachar Hills ofnortheastern India. According to the Pongsawadan Meuang Puan or the Muang Puan Chronicles, the Tai Puan, a Buddhist Tai-Lao ethnic group, are said to be the first people who migrated in the 13th century from China and settled in this province; they had established trade in metals and forest produce and consequently were prosperous. During the mid 14th century they were subsumed into the Lan Xang Kingdom. The Siamese wars in the 18th and 19th centuries resulted in the Tai Puans' loss of freedom. In subsequent years the Haw invaders from China ravaged the province and also Luang Prabang by looting. the Franco-Siamese treaties of In the 1890s came under French colonial rule under Treaty of French Indochina, which extended to a short period beyond World War II. During the Second Indochina War of the 1960s and 70s there was more suffering to the people of the province due to the Laotian Civil War between the Royalist and the Pathet Lao until the 1975 when the Pathet Lao took power. Xiangkhouang was the province most bombed by the USAF airplanes in support of the Royalist forces. As a result of this extended war, Muong Khoun, the original capital of the province suffered much damage due to bombing by the USAF and resulted in shifting of the capital to Phonsavanh. During this war, most of the temples built in the period from the 16th and 19th century were destroyed except for the Vat Pia Vat temple. The royalist were led by General Vang Pao, who was born in the province, during the war in the 1960s. Xiangkhouang Province covers an area of 15,880 square kilometres (6,130 sq mi) and has largely a mountainous topography. The province borders Luang Prabang Province to the northwest, Houaphan Province to the northeast,Vietnam to the east, Bolikhamsai Province to the southeast, and Vientiane Province to the southwest. The capital is Phonsavan. Xiangkhouang and Vientiane Provinces are part of the Nam Ngum watershed. Apart from floodplains, the largest area of level land in the country is located in the province's Xiangkhouang Plateau. This area is characterized by rolling hills and grassland whose altitude averages 4,250 feet (1,300 m). The country's highest peak, Phou Bia (9,252 feet (2,820 m)), rises at the southern side of the plateau, while the Plain of Jars is in the plateau's center. The province is 400 km northeast of Vientiane. Phu Bia at 2700 m elevation is the highest peak in the province, and also the highest in Laos. The capital city is at an elevation of about 1,000 m.s.l with Kham district situated in a low-laying basin at an elevation of about 600 m.s.l. Nam Et-Phou Louey is the National Biodiversity Conservation Area (NBCA) which covers a total area of 5,959 km2 extends within the Xiangkhouang Province apart from the Houaphan, Luang Prabang provinces. The park consists mainly of mountains and hills, with altitude ranging between 336 and 2257 metres above sea level. The area is the source of many rivers. It is named after the Nam Et River and Phou Louey Mountain (“Forever Mountain”). The area has a high level of biodiversity, and a number of endangered species including tiger, leopard, clouded leopard, Asian golden cat, marbled cat, civet, gaur,Sambar deer, white-cheeked gibbon, sun bear, black bear, Asian elephant, dhole, hornbill and three species of otter. Xiangkhouang Province is one of the main maize producing areas of Laos. The main centre for trade and tourism is Phonsavan. In the village of Ban Napia near Phonsavan, villagers re-use UXO scrap metal to make spoons to be sold as souvenirs. The war scrap metal is checked for safety beforehand by UXO Lao. This community based project provides valuable income for the villagers. As of 2012, 3 minor accidents involving the UXO metal had been reported. There are many notable landmarks in the province. The tourism department of Laos has listed 63 sites of which 32 are natural sites, 18 are cultural sites, and are 13 historical sites. Of these some of the important sites are the following. 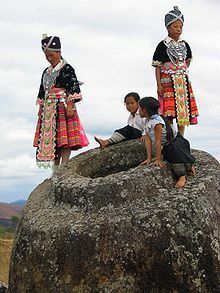 The most prominent and popular sites are Plain of Jars which consist of urns of large stone of height varying from 1–3 metres (3 ft 3 in–9 ft 10 in). They are found throughout the province at many locations throughout the provinces in bunches of 300 jars at each location. Archaeological studies have been carried out at many sites, which indicate that these were funerary sites of Bronze and Iron Age (2,000 to 2,500 years old) period megaliths. The nearest location of these urns from Phonsavanh is the Jar Site 1, with an area of 25 ha. The largest jar found here is of size 2.5m x 2.5m, while the rest are half this size. One jar has decorations on it. Muang Khoun is the 14th century ancient Phuan Kingdom capital. It is accessed southeast of Phonsavanh. Destroyed in the Indochina War, ruins of a stone wall with brick archways, relics of France’s colonial rule, a large size Buddha, pillars and short wall sections of Wat Piawat temple (built in 1564) are visible. Once buried in the forest, the 450 year old That Foun Stupa is visible near the road outside Phonsavanh. In the ethnic Phuan village, located to the south of Phonsavanh, Ban Napi mounds war scraps are seen buried in tableware. During the 1980s, creative thinking eight families resulted in putting together aluminum bits of damaged aircraft in mounds of melted lack, wood and ash. Such war debris are found scattered between Lang Waterfall and Jar Site 3. A secret tunnel was constructed below the hills of the Phu Kheng Jar Quarry Site during the Indochina War (1964–1973). The tunnel is approached by climbing about 1,000 steps. Along this route many bomb craters and broken or incomplete jars are found. The views of the Phoukoud valley at the end of the route are very scenic, and the entry to tunnel is not readily seen. The tunnel is 70 metres (230 ft) in length and 1.6 metres (5 ft 3 in) high. Reinforced concrete bunkers with night camps are also seen along this route. UXOs (unexploded ordnance) found in very large numbers in the province are in the process of getting cleared under aegis of the UK-based Mines Advisory Group (MAG). The Visitor Information Centre established by (MAG) in Phonsavanh provides information on the history of bombing campaign particularly of the cluster bombs and the destruction they caused during the war are explained through sketches and a documentary film. It is said that the bombing of the province was a record of a kind as "the most densely bombed area per capita on earth".